If your kids LOVE donuts and you’ve been trying to come up with some fun ideas for a donut-themed birthday party, Wikki Stix can help make your celebration extra special (indoors or outside). Try some of the Wikki Stix Donut-themed birthday party activities to make your next birthday party a success for kids. 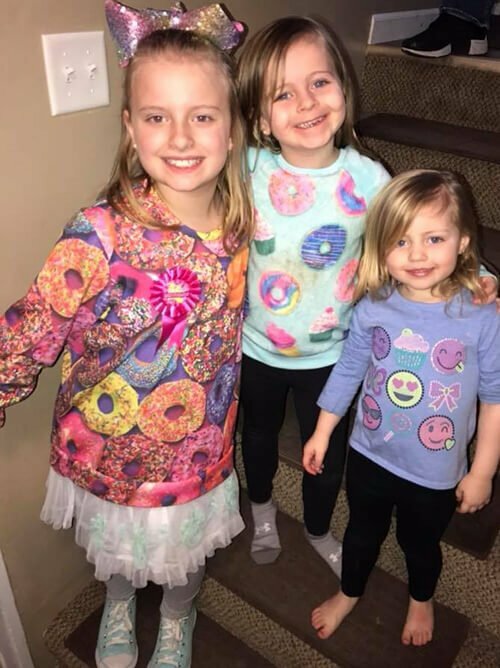 To help decorate for a donut-theme, print the free birthday quote and donut birthday banner below. 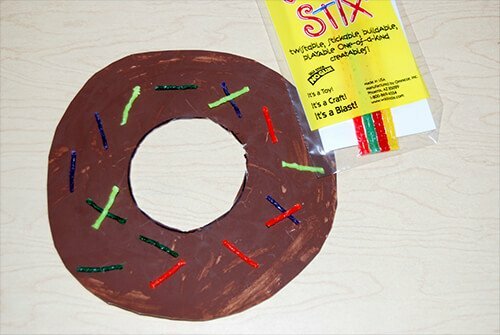 Kids can help cut out the donut banner and birthday quote to hang with Wikki Stix. Both decorations can be used inside or out for fun birthday decorations. Print the Free Donut Birthday Quote here. Print the Free Donut Banner here. Invite the kids to create the donut paper plate craft by setting all supplies out on a large table. Kids will be curious about the supplies and eager to create the donut crafts. Kids can paint the paper plate with either paintbrushes or scrunched paper towels. The entire plate should be covered in brown paint. Allow time to dry thoroughly while doing other activities. 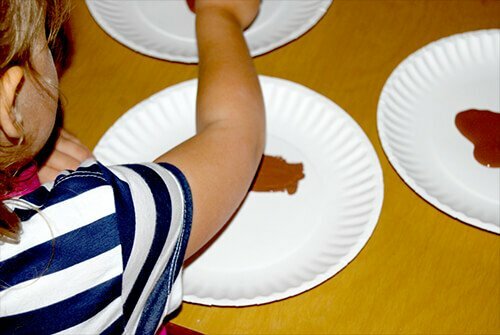 When the paper plates are dry, kids can cut a circle from the center of the paper plate with scissors. If desired, turn a paper cup (rim down) and trace around the cup to make the inner circle. Kids can then cut small pieces of assorted colors of Wikki Stix and press them firmly onto the paper plate to resemble sprinkles on the donut craft. Note: Wikki Stix party favors come in small packages that are perfect as a treat bag favor and for completing the donut-themed paper plate crafts. String the Donuts with a Super Wikki Stix. 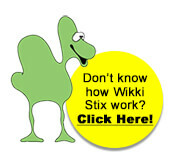 Have one adult hold each end of the Wikki Stix. 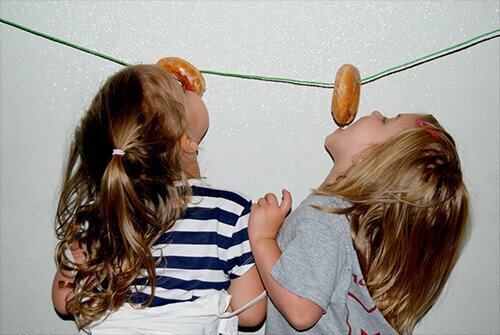 Invite two kids at a time to try and eat through the donut WITHOUT USING THEIR HANDS. Kids can only use their mouths to eat the donut off the Wikki Stix. The first child to eat through the donut and make it fall wins that round. Kids have a blast playing the game. It’s not as easy as it looks to eat a donut without using any hands. The game makes for some great birthday photos and videos, too. Give each child brown Wikki Stix and assorted colors of Wikki Stix. Place a large sheet of white butcher paper on a table or hang on a wall. Kids can create donut crafts with Wikki Stix directly on the butcher paper without the need for glue or tape. Read If you Give a Dog a Donut by Laura Numeroff to the kids. After reading, set out assorted colors of Wikki Stix and see what items from the book kids can create on their own. 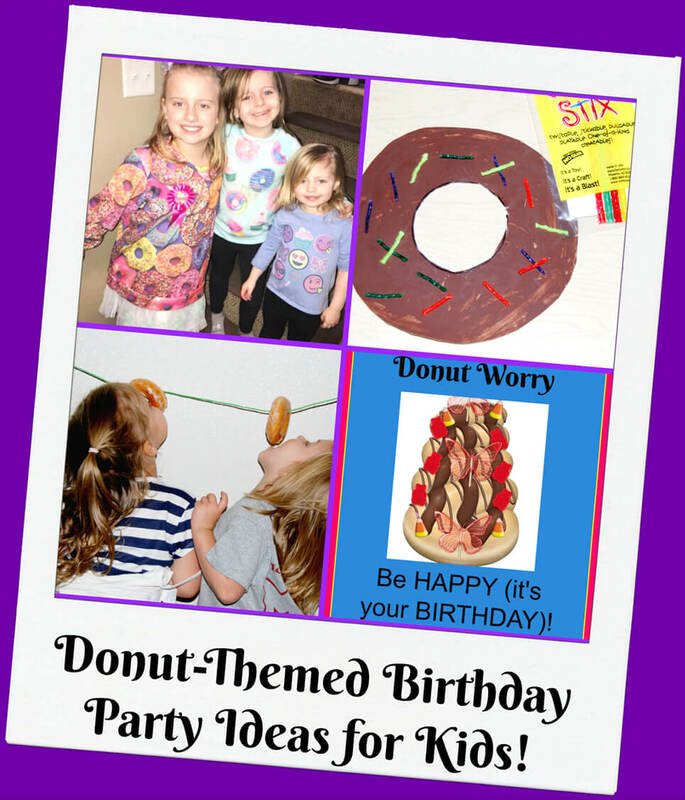 We hope your kids enjoy the donut-themed birthday party ideas with Wikki Stix. Be sure to order extra Wikki Stix favors to keep the fun going long after party time is finished. Try creating a mixed media US Flag craft for 4th of July parties with kids. For a Ninja Turtles birthday party, Wikki Stix has some fun creations for kids to make. Celebrate summer with Staycation ideas and Wikki Stix! For Pokémon lovers, try a backyard scavenger hunt at your next birthday celebration!